Finally, an easy to access alternative to Photoshop! If you've had a desire to learn digital image editing without the steep learning curve (or ongoing subscription costs) of programs like Adobe Photoshop, then here is a viable alternative. 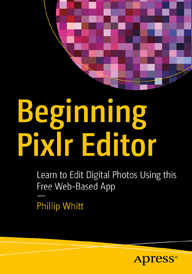 Beginning Pixlr Editor (a learning resource book by Apress Publishing) will show you how to harness the power of Pixlr Editor, the free online image editor by Autodesk. Pixlr Editor works in your browser, so there's no software to purchase, download, or install! If you're a visual arts teacher or a curriculum director who's been searching for an economical way to introduce digital image editing to students, then this is the answer. Note: Neither Apress Publishing nor the author are affiliated with Autodesk.